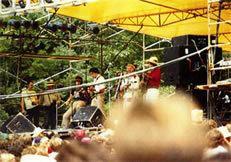 Stompin 76 History Page"The Woodstock Of Bluegrass"
Promoter: 21 year old Hal was from Baltimore originally. His new company, Cactus Productions was based in Las Vegas where he had moved to join his folks in 1975. He had attended community college for 2 years when he became impatient. Earlier, while attending college, Hal was assigned to take advance clowns and other performers around to P.R. appointments for Ringling Bros. & Barnum and Bailey Circus. This was his only involvement with show business he had. He only knew that he wanted to get into the concert business but knew it would be impossible to get a job in such a tough field to enter. The story: Once Hal had moved to Las Vegas in 1975 and founded Cactus Productions, Inc. he bundled the original investment with profits earned on the first set of concerts he promoted in Baltimore in 1975 and early 1976, then borrowing additional small amounts from people in the area some money. In Baltimore and in the County, he promoted Thin Lizzy with Golden Earring, Natalie Cole, The Persuasions, Quicksilver Messenger Service, Nils Lofgren with the original Spirit, Chick Corea and others in small indoor facilities. Concert tickets back then were $5.50, $6.50 and $7.50 and with 2,500-4,000 seat venues it became clear that small concerts were somewhat of a gamble and the profit margin was slim. He really couldn’t afford major concerts in the Baltimore Civic Center about 12,000 seats. But to reach his young target market, he would use more than 20 east coast rock radio stations. It worked in a day when there were very few music festivals and in the bicentennial year, he felt just about wanted to celebrate the nation’s birthday! All of the advertising would be coasted in red, white and blue. Something larger was what he needed. In the cold winter of February, 1976, he stopped promoting concerts and while in his apartment in Reisterstown one night, listening to music with a couple of friends, decided that bluegrass music was affordable and it could mixed with other compatible genres (like jam band music or blues) and he came up with the name "STOMPIN 76". It would be a great big bluegrass festival. Hal felt bluegrass music meant just as much fun as rock, was cheaper to produce and just as many people would come to it, if it was big. Hal learned to love bluegrass music. To this day, he appreciates learning of the ways, the culture and friendship of bluegrass people. Back then, ideas didn't cost as much to activate as these days. Even then, things were far simpler. There was no Ticketmaster yet. Phone charge was not popular yet either. The Start: Hal got started on Stompin 76 in late February 1976 and established the dates of August 6,7,8. Originally, the weekend after was scheduled, but the main talent agent, Keith Case said that talent availability was far better on the first weekend in August. Using his own money, his parent's and friends in Baltimore, Stompin 76 was produced with a total of about $30,000. He started an office in Baltimore County from his apartment and soon recruited a dozen enthusiastic young friends. Bluegrass Music: 3 years after Woodstock, Eric Weisberg's "Dueling Banjos" from the hit 1972 movie Deliverance stirred the bluegrass DNA within most young Americans. A surge of awareness in clubs and bars across the country sparked a modern interest in Bluegrass Music. Jerry Garcia's roots were in bluegrass and the sounds were in his guitar and mandolin playing. New, quality bluegrass festivals like Telluride were emerging. Many of the starring acts at Stompin had roots in Bluegrass then seeing the benefit of appealing to greater numbers, crossovered to rock, country rock, blues, new country, folk and other hybrids. Bands like the Grateful Dead, Poco, New Riders of the Purple Sage would have fit just fine, into the Stompin lineup. Actually, Kingfish with Bob Weir and Jerry Jeff Walker and the Lost Gonzo Band were originally confirmed as two of the support acts, but later (by late June, '76) the agents withdrew them due to scheduling conflicts. We then booked Bonnie Raitt, John Prine, John Hartford and others. You can see how the Stompin spirit was taking on it's own personality. It was about then I reached my hands to the sky and proclaimed "IT'S ALIVE!.. IT'S ALIVE". Bluegrass and new grass and the American bluefusion was growing popular that summer as was rockabilly and the blues. Teenagers all over America had already thought it cool to wear plaid shirts since Woodstock. For Stompin, a bluegrass lineup full of stars plus special stars like Bonnie Raitt made it a unique Stompin music lineup and format, never to be duplicated just like that! All bands advertised played. (See line-up below) Total talent cost: $100,000.00 paid out in increments to the bands that whole summer. And about $10,000. of it weeks after the event. Promotions: By promoting relentlessly all over the east coast in a full court press to the 18-25 demo; much of the force in the strength of dozens of rock radio stations, yes rock stations, back when that's all there was. That's where the target audience was and I was going to reach out and touch them. It was a clarion call to action. At least 30 radio stations, many newspapers, billboards, aerial ads over 5 beaches (Va Beach, OC MD, Myrtle Beach, Miami, Ft. Lauderdale, ads in the Village Voice and Rolling Stone, major street teams with those red and blue vinyl bumper stickers sent back with each order. Thousands of posters and flyers and a word of mouth that was historic in it's viral power to attract more than twice the size crowd we wanted. The mail orders continued despite the schedule change. The festival was catching fire, we were promoting in at least 12 states, VA, NC, SC, GA, FL, MD, NY, NJ, WV, MA, OH, DE. I don't remember promoting in TN or KY. The Talent Agent, Keith Case was then based in Colorado and the Telluride festival had just started. 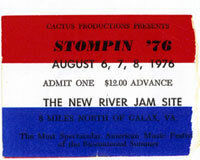 Keith booked many of the acts that appeared at Stompin 76. Hal was unable to pay a $10,000. Balance on the talent due. Keith was shocked when he received it in the mail shortly thereafter. Hal was then broke. Keith Case and Associates has been based in Nashville for many years now. It is Hal's opinion that Keith is the finest and most honest talent agent in the whole wide world. Hopefully, he will be involved with the next Stompin. Keith safely says "Cash in advance Hal". Hal agrees, this protects everyone on a first time show. Appearing on one stage Friday, Saturday, Sunday August 6, 7, 8 1976…. The Site: It was called The New River Jam Site. The search throughout northern North Carolina and southern Virginia began. Hal hooked up with an attorney Mickey Andrews who had knowledge of the Lawson farm. The farm was visited, then signed. Doyle Lawson's 400 acre farm was no match for the largest outdoor music festival the summer of 1976, and what would go down in history as the undisputed biggest and best Bluegrass festival in History. Hal remembers how kind and helpful Doyle Lawson was considering Hal was a cranky Yankee. How Big: Saturday night in the natural cow pasture amphitheater while Bonnie Raitt performed, over 70,000 folks crammed into the actual concert area. However, due to traffic backups, cars were being parked on the interstate over 11 miles away. People just parking their cars in the right lane and packing there camping items on their backs, kid's wagons, however they could. Huge tracts of farmlands surrounding the little one lane road up to the top of the hill where the site entrance was, were packed and crisscrossed with every kind of vehicle and campsite imaginable. The masses took over! IRS and State Police helicopters hovered above. (This was real BIG) If all were able to enter that wanted to get in, there would have been over 200,000 people in the actual concert area. Maybe many more, we will never know. Folks instead, just made a party wherever they could. "I'll always remember the foggy foggy night that the shuttle chopper couldn't get into or out of the festival site, and each band in the musician's area chose a representative that would ride along with John Prine's RV as it tried to make it through the clogged road to the main highway. It was night time and I sat up front with driver as he inched along the camper-infested access road. John and his manager had to leave the festival to make it to New York or some Northern place to make a concert deadline. John and company were in the back of the RV - whoopin it up, singing along with a Van Morrison tape. Outside the RV, people who were camped along side the road were shouting and coughing from the vehicle's fumes. After what seemed to be many hours of futile attempts, I eventually left the vehicle and walked back to the main road. I think that John and his manager got out and hoofed it to the main road. I guess he made to his gig. "No deaths and one birth, that's not a bad record" were the words Hal used to sum it all up. Due to the excitement and deteriorating nature of the security setup, Hal was ill all weekend, unable to eat, the week of the event Hal was just 114 pounds. He was called "The Stringbean Promoter". Saturday night Hal was seen sitting among security sucking on a steak to extract protein for survival. His nerves were shot. He could not keep down solid food. Hal was trying to count fields of people by using the "Richie Havens Woodstock- draw a grid on the window method" from the Sikorsky S-55 freight helicopter. Hal really liked that Chopper. Unfortunately the cost even then was about $3,500 a flight hour. "We used it a lot because the roads were unpassable." Bonnie Raitt wouldn't ride in any helicopter so after a lot of frustration, she jumped on the back of a Harley with her guitar, dress blowing in the breeze- got up that hill to the site pretty fast. Bonnie was young and brash. Hal (the 21 year old string bean promoter), remembered eating in the Downtowner Motel at the same time when Bonnie was unhappy with the service and threw her eaten fish skeleton at the waitress. Hal never met Bonnie. But he still has a lot of respect for her and hopes to one day have her perform at a festival again. She was great! She was the headliner Saturday night and went on about 10pm. The first thing she said when she saw the sea of stompers was " Wow, I've never seen this many people before". Of course, since then, she's seen a lot. Bonnie Raitt topped off Stompin 76. Everyone was captivated by her electric performance. She played with a band but didn't need one. She was on fire like the color of her hair. "The strongest memories are the musical ones. Bonnie Raitt doing a searing "Love Me Like A Man". The Dillards doing a gospel number, their acapella voices drifting through the Virginia countryside. These memories will stay in my soul forever."